Facts and information about the History of Clothing and regalia of Native American Indians and their Mukluks. 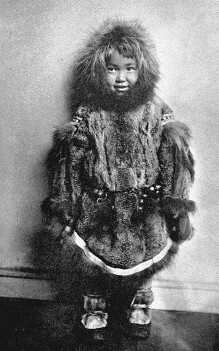 Mukluks, also known as a Kamiks or Eskimo boots, are a soft, supple knee-high boots traditionally made of sealskin, caribou or reindeer skin were originally worn by the indigenous people of the Arctic including the Inuit, Aleut and Yupik tribes. The name Mukluk is derived from the Yupik word 'maklak' meaning "bearded seal" in reference to the bearded-seal skin that was used to make the soles of boots. Mukluks were traditionally made using distinctive furs, leather and adornments to reflect the individual customs and culture of the indigenous tribes of Alaska. Mukluks Fact 8: The original tools used by the women to make the Mukluks were made from horns, antlers, bones and wood. The sewing and stitching was done using needles made of ivory or bone. Mukluks Fact 17: Layers of footwear were worn under the Mukluks depending on the temperature, the conditions of the ground and activities the people needed to perform. For additional facts about Artic clothing refer to Fur Parkas.